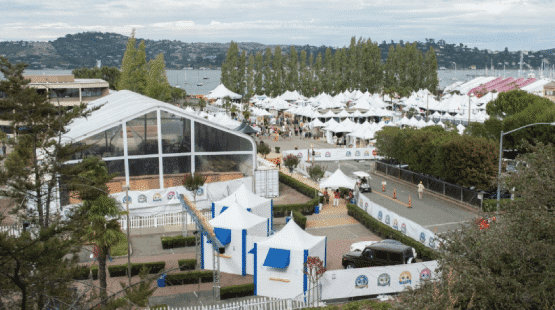 Each tented venue is unique to the location and design for each event. Our Tent Specialists have decades & decades of tent design, tent rentals and event logistics expertise. We’ve been covering California since the Gold Rush in 1849. Give us a call +1 408 856 3232 or send an e-mail to sales@stuartrental.com and we’ll prepare a custom quote. Better yet, come visit one of our showrooms and meet the Tent Specialists who’ll help you you choose the perfect style and size. 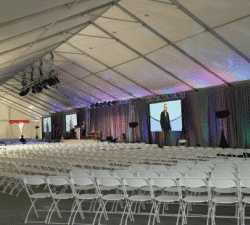 VIDEO DESCRIPTION: Stuart Event Rentals provided a 120 x 260 white maxibeam structure tent rental for an event collaboration with event company Destination Tahoe in Lake Tahoe. Beneath the tent, Stuart set up a large stage as well as numerous linen draped round table rentals surrounded by silver Chiavari chairs. The collaboration included lighting and audio fixtures for the presentations that were scheduled. A big thank you to Dax Victorino Films for providing this video. The canopy or tent rentals available to you will greatly depend on the kind of event you plan to hold and the way you choose to accommodate your guests. Allow us to help you select the right one and come up with a design that will surely impress everyone who attends. Tents offer the freedom of having your event however, wherever, and whenever you’d like. When people think about tent rentals, they usually associate them with protection from the elements: the rain, cold, heat, and sun. But tents can offer a freedom you don’t have when you choose an event facility. A tent gives you the option to house as many guests as you choose, and to decorate as you choose, without having to work around a room’s size, shape, features, and colors. With clear or windowed walls, you can even showcase the surrounding environment, while maintaining a comfortable climate for your guests. Click the tabs to learn about different types of seating, tents, flooring, walls, decor, and accessories. One of the first things to decide upon when you choose a tent rental is how you plan to accommodate your guests. The choice between served dining, buffet dining, cocktails, and theater-style seating will definitely affect the amount of space you need to cover. 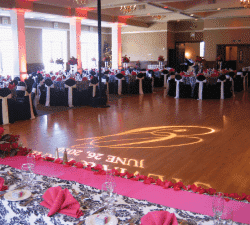 It will also vary if you plan to add other amenities to the venue, such as a dance floor, a stage for entertainment, or a space for a grand display. If you plan to have served dining for your guests, then your tent should be able to accommodate the tables of your choice and leave room for servers to move around. For an event with buffet dining, you might need to give your guests more room to freely return to the buffet area for seconds. 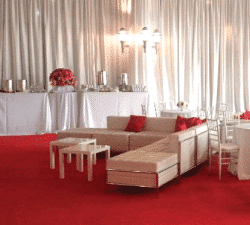 If your event only needs an open bar and cocktail tables, you may not need such a great amount of space. Smaller venues usually work better for cocktails as it encourages guests to stay close together. Larger events may require rows of theater-style seating, this allows for maximum occupancy where all participants are facing a single direction. There are three major kinds of tents: frame tents, tension tents, and structure tents. They differ in construction and shape and each has it’s advantages and disadvantages. 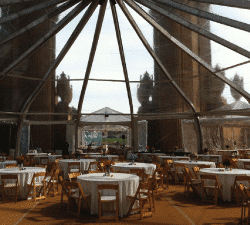 Your Event Specialist can help you determine which is best for your event and location. High peak tents have a curved ceiling that slopes to a point at the top. Cross cables at the eave of the tent support a center pole that extends to the peak to allow for an unobstructed space underneath the tent. This tension tent is erected by placing one or more center poles under the top, creating a swooping effect. This tent has higher centerpoles, creating a more “open” feeling inside. Larger clearances around the sides of the tent are required as these tents need to be staked to the ground. This type of tent features an assembled framework of metal arches that support the fabric roof and define the shape of the structure. The stronger construction of the Structure’s framework makes these tents suitable for larger or longer-term applications than other types of tents. 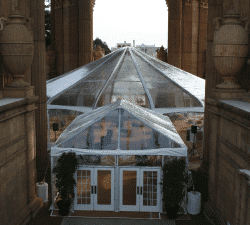 Structure tents also allows for large areas of unobstructed “clear span” space beneath the fabric roof. The larger structures require heavy equipment because of the size and weight of their parts. 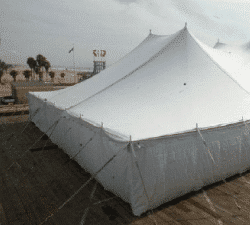 There are also tents of different shapes, such as round, hexagon, or oblong, custom tents, clear tents, and more. 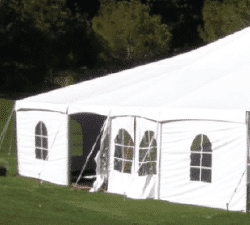 Please ask a Tenting Specialist for more information on how Stuart Rental can customize your tented event. 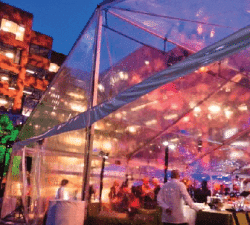 Tents have been used to enclose outdoor events and protect guests from inclement weather. What some people don’t know is that they can also be used to aid construction projects. 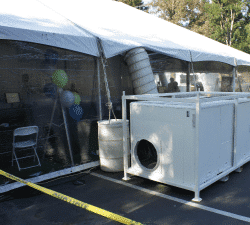 Construction tent rentals in the Bay Area provide cover for different projects, such as building remodeling or construction, to shield the worksite and crew from various weather conditions. Tents can be installed on many different types of surfaces, including grass, dirt, asphalt, concrete, tennis courts, over swimming pools, etc. If you choose to cover the surface with flooring, you have several options. A wood subfloor is constructed of wood framing with plywood applied on top. It can be constructed over virtually any surface, including an uneven surface, a moderate incline, or even a swimming pool, providing a safe and sturdy surface. Often, the plywood subfloor is covered with artificial turf or carpeting. This rigid plastic subfloor is a heavy duty, high value flooring solution that is safe on grass and perfect for events on primarily flat surfaces. Available in several colors, artificial turf and/or carpet can cover most surfaces, but does not protect against rain or mud. 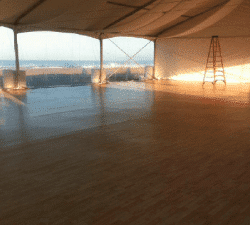 If the tent is on a level surface, a dance floor can be installed directly onto the ground. It is recommended that a tarp be placed underneath the dance floor if the surface is grass or dirt. Contemporary tents offer several different types of walls at varying heights (8′, 12′ or 14′). They offer protection against the elements or provide privacy while incorporating your event theme. The most common wall offers privacy and a clean, white palate for your decor. The decorative “Cathedral” windowed walls offer additional light and outdoor views. Clear walls protect your guests from the elements while incorporating the surrounding scenery. If protection from the elements is not your concern, you can construct walls from various materials including sheer fabrics and lattice covered with ivy. Tent decor offers you endless opportunities to turn your “vision” into reality. You can create virtually any setting or theme, with the level of detail dependent upon your budget. 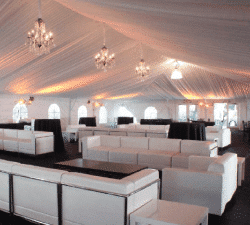 Listed below are some of the more common types of tenting decor. You can drape the ceiling of your tent in many different ways and with many different materials. The most common techniques used are: fully pleated, minimal pleating, and flat “false” ceilings. Some commonly used materials are velon, muslin, and duvateen, but virtually any flame-proof fabric can be used. There is also the option of backlighting the ceiling liner or casting decorative gobo light patterns on them. Sidewalls can also be draped using similar techniques as ceiling liners. Full pleating, minimal pleating, and smooth liners are all available. Partial swaging is used to create interest and focal points. You can use fabric, vines or props to create intricate garlands that are draped across the ceiling of the tent. Tent poles can simply be wrapped with material or can take on lives of their own with some creative ideas. Lighting can transform a tent from a simple open space into a dramatic, romantic or magical environment. 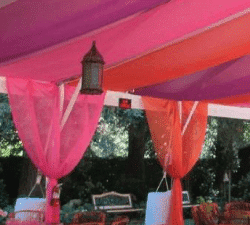 Color washes, patterned gobos, focused pinspots, and dramatic chandeliers are but a few of the techniques used to transform a tent. Props and plants can add interest to your event and also hide undesirable rigging elements related to tenting. 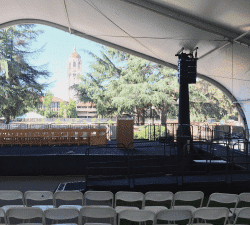 Special event tenting can also offer many other accessories and options. A few of the more common accessories are listed below. An entry to a tent can be as simple as a section of wall removed, or as sophisticated as a marquee entrance or real french doors. Tents can house multiple levels or tiers with connecting stairs or ramps. Staging can be created in varying sizes and heights or be custom made to your specifications. If the event location does not offer adequate restroom facilities, portable restrooms can be brought in for the event. 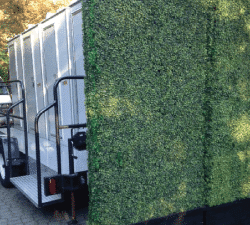 These restrooms can be as elaborate as a mobile trailer with separate men’s and women’s rooms that contain individual stalls, sinks, mirrors and ambient lighting. Heating and cooling is available for your tented environment. If the site does not have the capacity to power these machines, a generator can be used to power them. There are many other options and considerations when renting a tent. 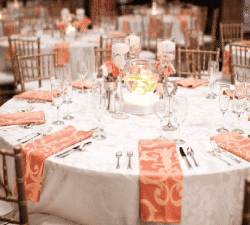 Your Event Specialist will discuss all the appropriate options that relate to your event. 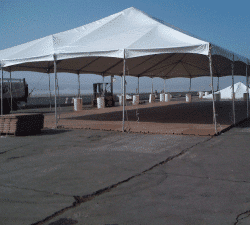 Below is a list of additional considerations that relate to most tent installations. Permit Assistance – Canopy/Tent 400 sq ft or larger require a tent permit from your local fire prevention. Price for permit will vary per city guidelines and codes. Site and Utility Survey – Site inspections are available. A non-refundable fee for the site inspection will apply towards your canopy/tent rental. If you have any questions about any of these topics or something that is not listed here, please contact an Event Specialist at (408) 856-3232 or send us an email @ Contact Stuart.